A crowd assembled by the walls of the Imperial palace in Peking listens to a Mandarin reading a decree – anyone who wishes to win the hand of Princess Turandot must solve three riddles; whosoever cannot answer must die. The young Prince of Persia is to be executed this night. The excited crowd rushes towards the palace, but the guards keep the people back. An old man falls to the ground. In anguish, a young girl calls for help. A young man rushes out from the crowd, recognising the old man to be his father. Their unexpected meeting is not a joyful occasion – old Timur´s enemies have usurped his throne and banished him from his native land; his son Calaf has been forced to wander foreign parts, hiding his name from everyone. Timur is accompanied everywhere by the faithful slave girl Liù, whose love for Calaf is unrequited. Preparations for the execution are underway on the square. Night descends. As the moon rises, the crowd awaits the appearance of Turandot. A triumphal procession approaches. It is met by a funeral procession – that of the Prince of Persia going to his execution. The people feel pity for him and beg Turandot to have mercy on him. Calaf vengefully curses the hard-hearted Princess. Finally, however, she appears, and Calaf is blinded by her beauty. In vain, his father tries to dissuade him: Calaf knows he must win Turandot´s heart. Suddenly the ministers Ping, Pong and Pang bar his way. They warn the Prince and jeer at him, summoning the spirits of those who have died from their love of Turandot. Liù begs Calaf to leave – neither she nor his father could bear to see him die. Calaf is touched by her entreaties, but cannot relinquish his love for Turandot. At his signal, a servant strikes a huge gong three times, declaring Calaf´s decision to attempt to win the Princess. Ping, Pong and Pang are pondering the fate of the unknown Prince who has decided to solve Turandot´s riddles: what will dawn bring – a wedding or an execution? They dream of returning to a peaceful and tranquil life, far, far away from the Imperial palace. But madmen in love continue to try their luck, and their heads continue to roll in honour of the Princess. 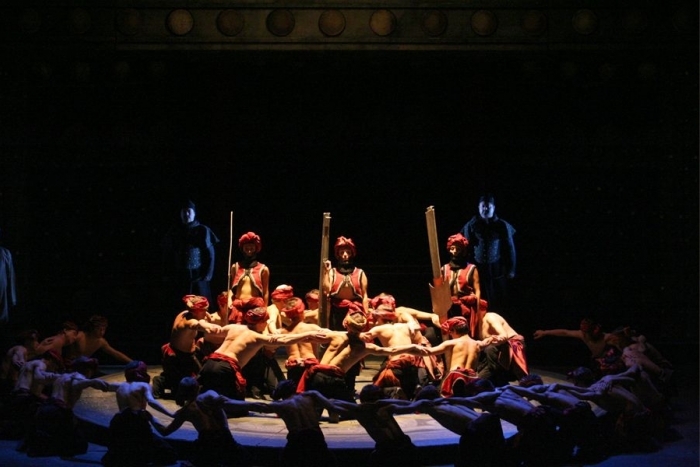 When will the suitor come who will defeat Turandot, who can transform her by love and put an end to these perpetual executions in the country? The crowd gathers on the square before the palace. Timur and Liù are also there. At last, Emperor Altoum appears. He tries to dissuade the Prince from the attempt. The Mandarin repeats once again the dreadful conditions of the challenge. Turandot announces her first riddle: what bright, alluring vision is created at night and dies at dawn, only to return the next night? The Prince answers that it is the hope that will bring him to Turandot. The wise men confirm that hope is indeed the answer to the first riddle – it is written thus in their scrolls. The second riddle is announced: what is like a flame, yet is not a flame? What runs cold when a man dies, but burns hotter than the sun if he succeeds? In his confusion, Calaf is silent. The Emperor, Liù and the crowd encourage him and he finds the answer – it is the blood that flows in his veins from his love for Turandot. The Princess is struck with rage and fear and she hurries to pose her third riddle: what is like ice but freezes in fire? What makes a man a slave if he wants to be free and makes him a King if he becomes its servant? In triumph, Turandot mocks the Prince. What kind of ice could he burn in? However, Calaf solves the third riddle: it is Turandot , and the ice of her heart will melt in the fire of his love. The crowd praises the victor. In terror, Turandot begs her father not to marry her to the stranger, but the Emperor is unyielding – his word is sacred. Calaf, however, will not accept Turandot´s hand against her will as he desires the Princess´ love. He sets Turandot just one riddle which she must solve by daybreak: in all Peking not one person knows his name. If the Princess can discover it, he will die willingly. The sounds of far-off heralds can be heard in the garden of the Imperial palace – Turandot has decreed that none shall sleep this night in Peking on pain of death; the name of the unknown Prince must be discovered by daybreak. Calaf dreams of Turandot´s love: she will only know the answer to his secret when he holds her in his arms. Daybreak will bring his victory. 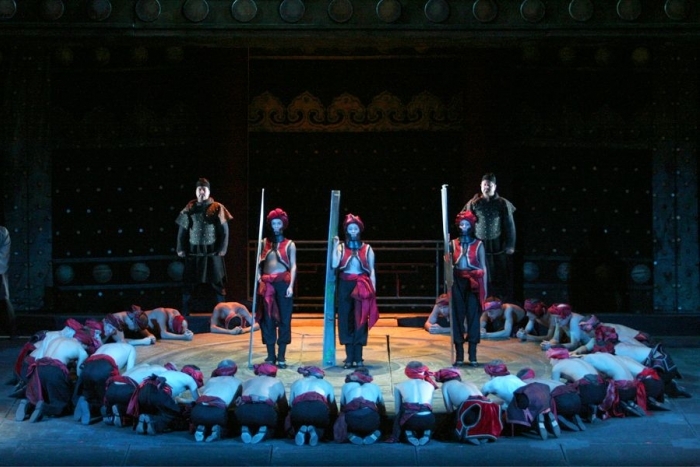 Ping, Pong and Pang tempt Calaf with the delights of love, wealth and ultimately compassion – thousands will be tortured to death if Turandot does not know his name by dawn. But Calaf firmly resists all their temptations: the entire world may perish, but he will not be denied Turandot. Liù declares that she alone knows the Prince´s name and nothing will make her reveal the secret. 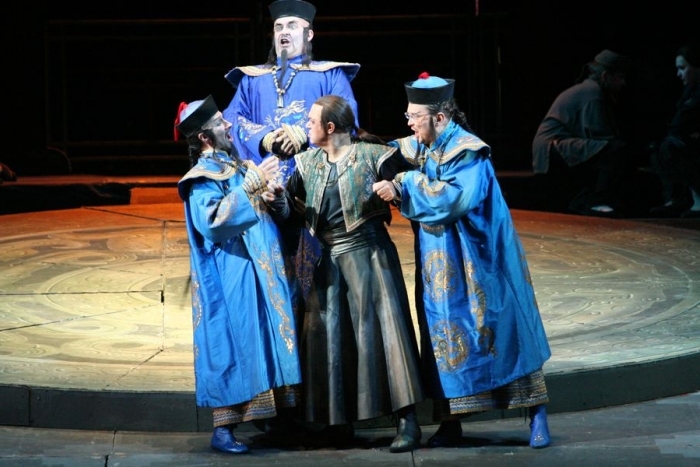 Turandot is confounded by the slave girl´s courage. Where does she get her strength? It comes from the power of love for which Liù is ready to die. 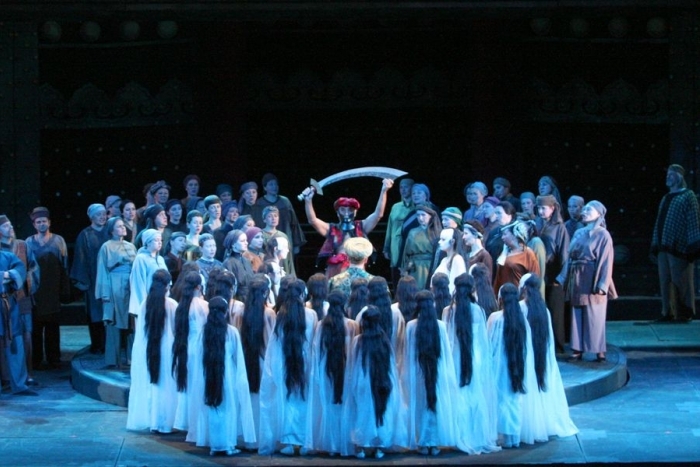 Turandot will know it herself soon, though Liù will not live to see this – snatching a dagger from Turandot, she stabs herself. Timur and the crowd are broken-hearted at Liù´s death. With ardent words and kisses, Calaf awakens the love in Turandot´s icy heart. The stranger´s courage and passion have defeated her pride – now she is his. And so, the Prince tells Turandot his name. Night passes and the sun begins to rise. Before the assembled crowd and in the presence of the Emperor, Turandot gives the answer to Calaf´s riddle: his name is... love. Everyone sings in praise of love, light and life.